An experimental chemical from a space station crashes down on earth where it transforms three animals who come in contact with the canisters, turning them into gigantic, aggressive monsters. Now, it's up to a zookeeper and a scientist to stop them from destroying the city of Chicago. Oh look, it's a movie adapted from a video game. Will this one be yet another example to add to the pile of awful adaptations, or will it be something that's half-way decent (which might make it the best video game adaptation ever)? "Rampage" is directed by Brad Peyton, who has made films like "Journey 2: The Mysterious Island" and "San Andres," both of which star Dwayne Johnson. The story is written by Ryan Engle, though an additional three writers worked on the screenplay. It is adapted from the 1986 Midway arcade game of the same name. 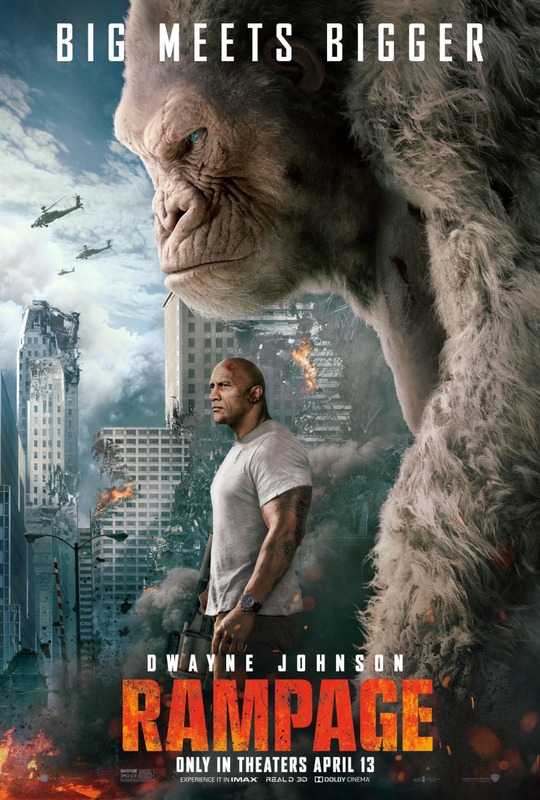 The aforementioned Dwayne 'The Rock' Johnson teams up with Peyton once again, this time as Primatologist Davis Okoye, who works for the San Diego Zoo...oops, we mean the San Diego Wildlife Preserve. There, he is head of the primate exhibit, though he was in the military in the past and has a long service record of fighting against poachers in Africa because of course he does. 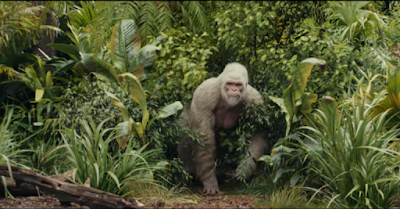 He has a special relationship with a rare albino gorilla named George, whom he rescued from poachers when George was just a baby. When an experimental chemical that was once stored in a space station crashes down to earth, George is infected by a canister that landed in his enclosure. The chemical inside of it makes anything it infects bigger, stronger, faster, and more aggressive. Energyne, the company that designed the chemical, wants all of the infected creatures for itself. Now, it's up to Davis, a former scientist named Dr. Kate Caldwell (Naomi Harris), and a cowboy-like government agent named Harvey Russell (Jeffery Dean Morgan) to save George and to stop the other giant animals from destroying Chicago. There are tons of video games with highly in-depth backstories, giant universes, and a bevy of characters, many of which have already been adapted into films. All of them have failed (and mostly miserably at that). "Rampage" is a video game with three characters, all of whom are giant monsters: George the giant Gorilla, Ralph the giant Wolf, and Lizzy the giant Lizard. The entire point of the video game was for these creatures to smash buildings and eat people. That's about it. So who would have thought such a simple video game would wind up being one of the most fun and most entertaining game-to-movie adaptations ever made? Maybe it's because the game is so damn simple that it works so well. It doesn't spend a lot of time trying to shove in details about characters and it doesn't need to get the specifications about the world correct. All you need for a "Rampage" movie is three big monsters and some buildings for them to destroy. Look, when it comes to the overall story in "Rampage," it's terrible. We fully acknowledge this as fact. The narrative doesn't make any sense. Much of it is contrived, and there is even some deus ex machina thrown in for good measure. The script and the dialogue are loaded with cheese, and not just a little sprinkling of cheese on your Olive Garden salad, we're talkin' a "double grilled cheese sandwich topped with hot nacho cheese and then sprinkled with Cheeto dust" amount of cheese. Every single character is more like a caricature than a real person. This sentiment goes double for Jeffery Dean "I'm a pearl-plated, gold studded pistol kind of cowboy" Morgan's character Harvey, as well as the two main villains, a brother and sister duo named Brett and Claire Wyden (Jake Lacy and Malin Akerman). As for Dwayne Johnson, well, he's 'The Rock' yet again, but this time, he's got a gorilla for a best friend. Johnson drips more charisma than he does sweat, and goddamn it, we love it. Oscar nominee Naomie Harris is the stereotypical scientist who spouts buzz words every chance she gets and gets saved by Dwayne Johnson every three minutes, and goddamn it, we love it. Despite all of its problems, "Rampage" really gives the audience what they want: monsters wantonly demolishing buildings and eating people with an overabundance of chaos. There is no rhyme or reason to anything that happens, it's just a mindless action movie, you know, the ones where you can simply turn off your brain, munch popcorn, and enjoy the extremely fun ride in front of you. In the end, we had a blast watching this film, especially in the third act. 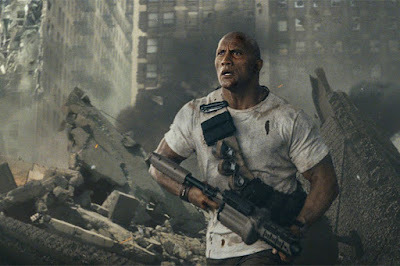 Though the bar is really, really, really low and it's debatable depending on your point of view, "Rampage" is probably one of the best video game adaptations ever made.